Western North Carolina has 3.2 million acres of timberland. The mountain region, an area of rugged terrain and limited access, has relatively few large cities compared to the rest of the state. Upland hardwoods cover the majority of the forested landscape, and white pine is the most common softwood type. Ownership of the region’s timber is dominated by the private sector. Roundwood refers to logs, bolts, or other round sections cut from trees for industrial manufacture or consumer use. Saw logs are at least eight feet in length and can be processed into a variety of sawn products, such as lumber, cants, pallets, railroad ties, and timbers. Veneer logs are roundwood products that are either rotary cut, sliced, stamped, or sawn into a variety of veneer products, such as plywood, finished panels, veneer sheets, or sheathing. Pulpwood is wood that is reduced to individual fibers by chemical or mechanical means. The fibers are used to make a broad generic group of pulp products that includes paper products as well as fiberboard, insulating board, and paperboard. Fuelwood is roundwood harvested for residential use. Fuelwood consumption is falling because it is labor intensive and considered less safe than alternative energy sources. Domestic fuelwood does, however, account for a fairly significant portion of hardwood product output (22 percent) in the region. Other industrial wood products include composite panels manufactured into chips, wafers, strands, flakes, shavings, or sawdust and then reconstituted into a variety of panel and engineered lumber products. Posts, poles, and pilings are milled or cut and peeled into standard sizes (lengths and circumferences) to be put in the ground to provide vertical and lateral support in buildings, foundations, utility lines, and fences. This category may also include non-industrial unmilled products. Saw logs dominate the market in both softwood and hardwood product distribution in the region. From 1995 to 2007, of the total average distribution of softwood products, 13.2 million cubic feet (71 percent) was saw logs. From 1995 to 2007, of the total average distribution of hardwood products, 26.1 million cubic feet (50 percent) was saw logs. Saw logs, the most valuable roundwood product, are cut from the largest and most mature trees. The volume of sawtimber is increasing in the region as the forest reaches maturity. From 1995 to 2007, of the total average distribution of softwood products, 4.2 million cubic feet (22 percent) was pulpwood. From 1995 to 2007, of the total average distribution of hardwood products, 11.4 million cubic feet (22 percent) was pulpwood. Brown, Mark J., Barry D. New, Sonja N. Oswalt, Tony G. Johnson, and Victor A. Rudis. 2006. North Carolina's Forests, 2002. Resour. Bull. SRS-113. Asheville, NC: USDA Forest Service, Southern Research Station. 63 p. Accessed from: http://www.srs.fs.usda.gov/pubs/26000. Straka, Thomas J. 1995. “Auditing timber assets.” Internal Auditor, June 1995. Accessed from: http://www.allbusiness.com/accounting/methods-standards/509452-1.html. USDA Forest Service, Southern Research Station. 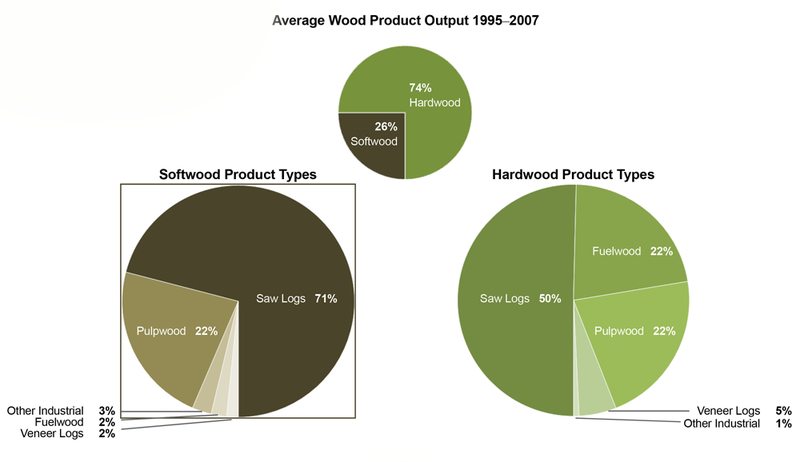 Forest Inventory and Analysis: Average Volume of Roundwood Products by Product and Years, 1995-2007. USDA Forest Service, Southern Research Station. North Carolina’s Timber Industry: An Assessment of Timber Product Output and Use, 1995-2007. Resource Bulletins SRS-18, 39, 73, 94, 112, 127, 156. Total Wood Product Output: NEMAC. Distribution of Softwood and Hardwood Product Types: NEMAC.